Welcome and thanks for visiting Joe's 3D Workbench. My name is Joe Larson. 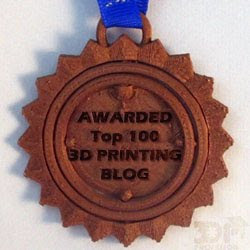 I am an award winning 3D designer, author of the beginner's introduction to 3D design using Blender, 3D Printing Blueprints, and well as the designer of a growing library of over 100 objects on Youmagine and PinShape. When I won a 3D printer from the Makerbot/Tinkercad Chess challenge I started a the Joe's Makerbot blog to share my excitement. Now my adventures are branching out as I become a designer, author, and entrepreneur, and it's time my blog be about more than just a 3D printer. I hope that you'll add this blog to your RSS feeder, like on Facebook, and subscribe on YouTube. Join me on an adventure at my 3D Workbench.